I have been working hard on my Green scraps, I just have not been good about Blogging about it. The first week I got 9 of these 6 1/2" blocks done. they use 2" squares. I had some 2" square cut and left over but trimmed up a few more so I had good variety. See how much is tided up. I have more green scraps then any other colour. Most of the time I have Lime sorted out, but this month I have some mixed in. I love green! I got 27 pinwheels done. So now I have enough to make a little quilt. Last winter I started to make pinwheels but last year I did not get to my green. I have started to sew it all together. It will be so cute. a perfect baby gift. 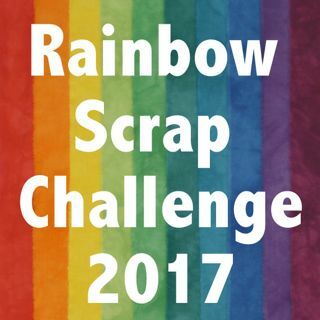 I have added this post to the link up on Socrappy as it is part of the Rainbow scrap challenge 2019. JUst love your pretty little pin wheels!! Those GREEN Pinwheels were the PERFECT addition to your design!! Lots of fun stuff going on there. I LOVE all your pinwheels! !